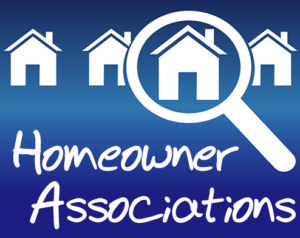 If your home is a part of an HOA: We recommend taking these following steps:- Check if your HOA has a list of approved shingle manufactures. – If not listed as an approved shingle manufacturer, follow the requirements to get Malarkey approved. – Once Approved, check if your shingle selection and color have also been approved. – Notify us immediately about any restrictions or possible roadblocks that could halt the process of installing. TREES/PLANTS: If you have low hanging branches over your driveway or roof, some trimming may be necessary. 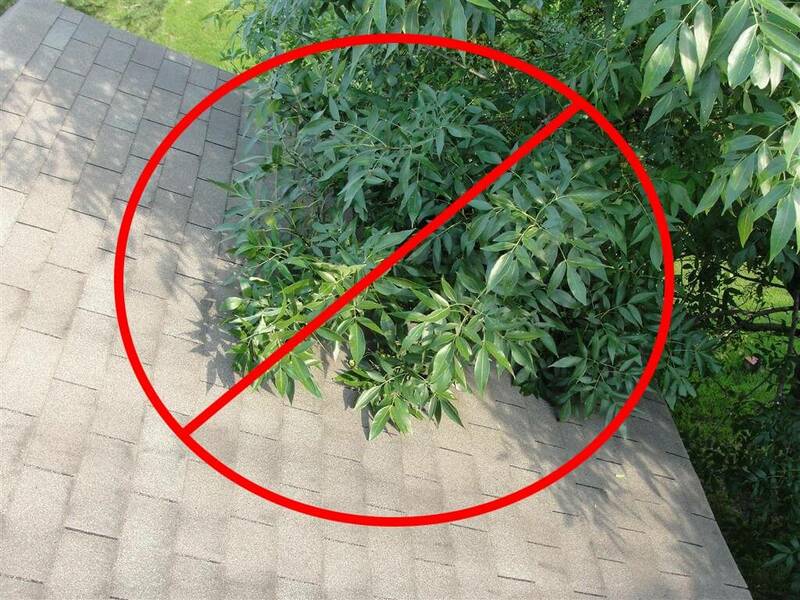 Our crews will cut back only those branches that limit their ability to do an efficient job on the roof. All shrubs, bushes, and flowers next to the structure will be protected with plywood and tarps to help prevent damage. Yard art within 10’ of the house perimeter should be moved away by the customer prior to the roof removal process. We are not responsible for damage to items not moved out of harm’s way. You may need to cut any plants or bushes around your house in order for our siders and roofers to have proper access to your siding. You may also want to protect any valuable plants that may be in harm’s way while we are working on your house. We will protect plants and scrubs the best we can with tarps or plywood, but ultimately the responsibility for your plants and scrubs remains that of the homeowner. SECURE ANIMALS: We will be working on your home and need full access from all sides of your home. With that being said, we are not responsible for your animals getting out. 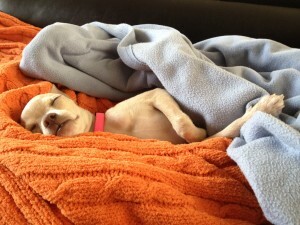 Pets should be kept indoors. If outdoor pets are present, please ensure that they will be secured for the entirety of the job as our crews will need full access to the grounds in order to protect and clean your yard. We value pets and do not want any animals getting lost or injured. NOISE: Re-roofing is a noisy business. 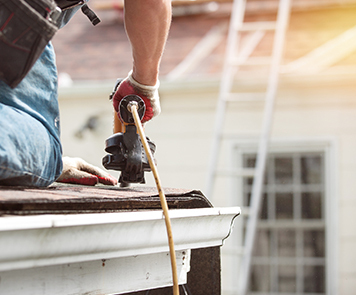 Throughout the process of removal and installation of your new roof you will hear banging, hammering, vibrations, etc. 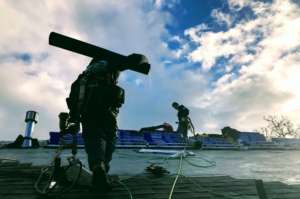 Some customers elect to leave the premises during the roofing project. ACCESS: We make every effort to complete your job in the most efficient manner possible. As a result, we place materials, trailers, trucks, and equipment as close to the structures being re-roofed as possible. 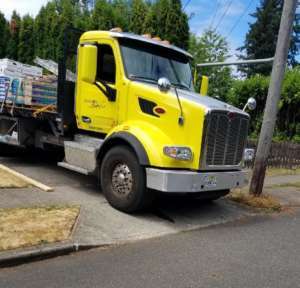 In most cases, we’ll need access to the entire driveway for the duration of the job. If access is critical and you must have any of these items placed further from the premises, please advise us before the job begins. If there is an additional cost due to this, we will let you know before we move or stage the item(s). DUMP TRAILER: The dumpster/dump trailer will be at your home either the day before the install or when it is started. We would like to get the dumpster/dump trailer as close to the house as possible. Using the driveway will typically be the best place for this. Please remember that if you use your garage, we will be blocking access until the dumpster/dump trailer is removed. 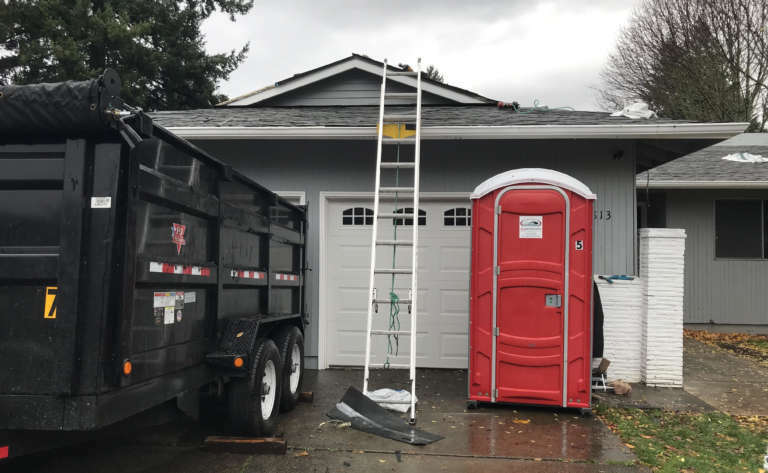 Customer understands that due to the age and quality of driveways, Giron Roofing Inc, is not responsible for any consequential damages to the driveway due to the placement of the dumpster. Roofing Shingles: Will be delivered on the start after the tear has started. 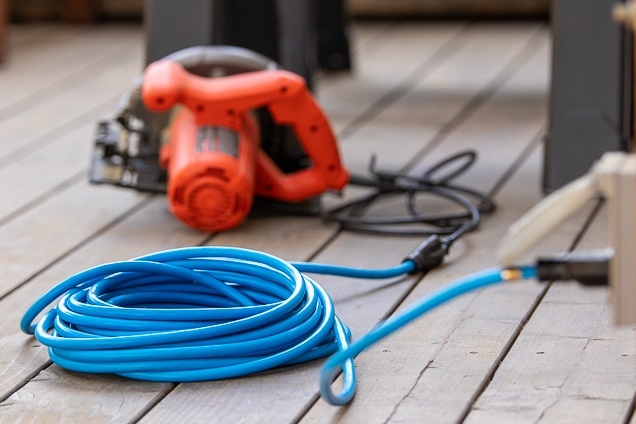 ELECTRICAL OUTLET AND WATER ACCESS: Most buildings have outlets and water outside of the homes, but on occasions we need to arrange for an extension cord (which we will supply) or hose out of the house. HIDDEN CONDITIONS: Please understand that the condition of your roof deck and siding cannot be verified until we remove your existing shingles. It will be necessary to replace any rotten or broken lumber. In that case, it will be an additional charge unless it has already been figured into your base bid. We will notify you if your siding is substandard upon roof covering removal. Why do we need to resheet over the existing shiplap on my roof? 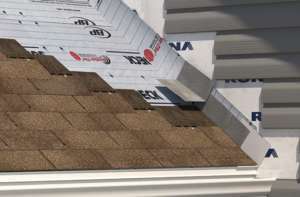 If you have an older home built prior to 1970, then you may be wondering why your roofing contractor is wanting to re-sheet your roof deck before installing your composition shingles. This is most likely because your roof was build using shiplap as a solid substrate for the roofing system. Some contractors may insist the manufacturer will warranty the product even if laid on “solid” board sheathing. But the manufacturers’ warranties will not cover leaks; all they warrant is manufacturing defects. The cure. 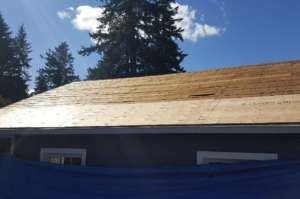 If you want new asphalt shingles installed then solid sheathing must be applied first. This can be exterior grade plywood or oriented strand board (OSB). 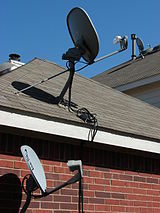 SATELLITE DISH: Any satellite dishes that are mounted directly through the roof may need to be moved to allow us to properly install the new roof. You may need to contact your satellite company to reset your dish. Lightning rod systems, weather vanes, or other miscellaneous non-roof related projections may require disassembly/reinstallation. We will attempt to re-install these items where possible, but cannot guarantee. 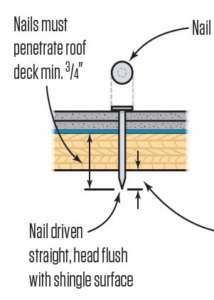 NAIL PENETRATION: Proper roof installation requires that some nails penetrate the sheathing, even on the eves. This proves proper installation was performed in the event of an inspection. INSTALLING FLASHING BEHIND PAINTED SIDING: In order to ensure that your roof is watertight, it’s necessary to install metal flashings where the roof and siding come together. To do this work we may need to pull the nails from the siding or even remove the siding which can cause chips in the paint and sometimes may crack the siding. 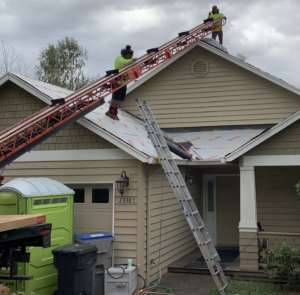 We make every effort to ensure all work is performed as carefully and neatly as possible, however, cracked siding and paint needing to be repaired because of the roofing process is additional work not factored into our estimates and can be performed by us upon request at $___80___ /hr. plus the cost of materials. Multiple Layers and Siding: When a roof has 2+ layers on it where the roof meets the siding, after removal, the siding may be bare, have a different color of paint, or exhibit caulk/tar marks on the siding that the old roofing covered over. 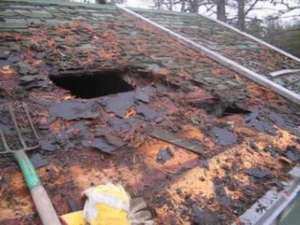 As the roof level lowers, these defects may become exposed. If this is the case, Giron roofing inc can refer a painter to you to work with /hr. plus the cost of materials. 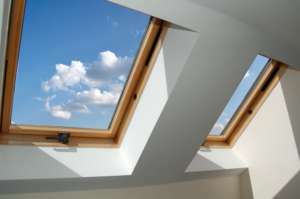 SKYLIGHTS: It may be necessary to remove your skylights to re-flash them and normally it will not create any issues, on rare occasions it could cause cracks in the drywall or the paint to chip. You may need to touch up this area if that occurs. Tarp the areas under your skylights is recommended. (we often do not have access to your home during this process). 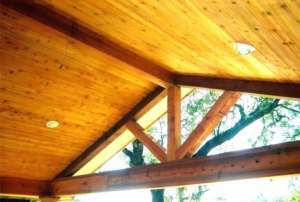 Tongue and Groove and Ship Lap Ceilings: Homes with visible wooden tongue and groove or ship lap ceilings will most likely need to exercise extreme care and protection of the inside of the house. Typically hundreds of pounds of black asphalt dust and debris find their way between the wood joints which can cover and invade all uncovered items: Furniture, shelves, clothes in closets, appliances, counters, beds etc. 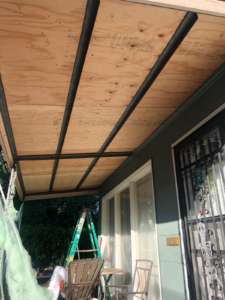 We recommend you plan to do the following: Cover all rooms and items which are beneath exposed wooden roof deck ceilings with plastic tarps/drop cloths that can be found at any hardware store; vacate the area for the duration of the removal and install; plan to spend 1-2 days cleaning up the debris or hire a cleaning service. We do not want this to be a surprise to you. If you are not sure whether or not your roof falls into this category please ask your field consultant or call our office. Open ceiling Garages/Sheds: Some debris may fall between your roof deck boards into your attic or open garage also. We suggest you cover or remove any items that may need protection to avoid damage. TEAR-OFF DEBRIS: On most roofs, there is a lot of debris created during the tear-off. This includes nails, old shingles and other roofing related materials. For this reason, please take extra precaution until we can get everything picked up. Do not let children or animals to play around the work area until we are finished. Our crew will do a thorough job of picking up the roof related debris including using magnet to collect the nails and staples. However please realize that as hard as they try there still might be a hand full of small pieces that they miss. 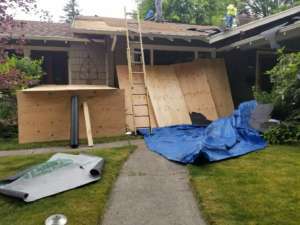 SAFETY: Please be advised that there will be falling debris and objects during the roofing installation. For your safety, please make our crew members aware of your location at all times when entering or exiting your residence. PARDON OUR MESS: We ask for a little forgiveness during construction, there will be some mess around your home while we are working and there is a plan in place to clean up and haul away excess debris to your satisfaction when we are done. (Feel free to call anytime regarding this). CLEAN-UP: There is a possibility that there may be a minor amount of debris that has fallen under the dump box or trailer and is not visible until the dump box or trailer is removed from the premises. We run a magnet thru yard upon for any metal or nails. We will do a final clean up before the final walk through is scheduled. Homeowners should inspect the driveway for nails and debris after the dump box has been removed just to make sure it is safe before driving on it. if there is anything left behind the final walk through is the best time to discuss any issues. 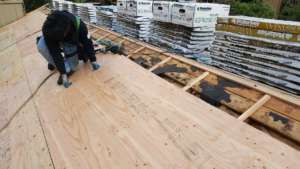 NEW WOOD: When it comes to replacement of any sheathing or wood that is exposed (i.e along eaves or exposed covered patios), it will be left as bare wood. Giron roofing is not responsible for painting or sealing. EXTRA PRODUCT: It is understood that extra product will be ordered for your job. This is in order to prevent any unnecessary delays in completing your project. Any extra product is the property of Giron Roofing Inc.
GUTTERS: Sometimes when you have your roof replaced your gutters may need to be adjusted so your roof drains properly. 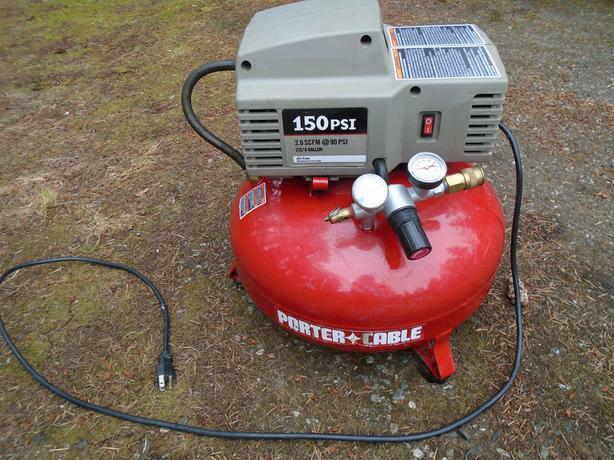 (This can be accommodated for an additional charge, unless we are replacing the gutters). PAYMENT: Payment is due in full the day the job is completed. We ask that you please be considerate of this request. Checks should be made out to Giron roofing inc in the amount stated on your proposal plus any additionally requested work during the job. If you are unclear about the amount, please notify our Field Supervisor or call the office. We are also able to take Visa and Mastercard. A fee of 3%. Regardless of the type of credit card, this fee is applied to all transactions. . These are taken over the phone. Receipts will be mailed to you after processing. PHONE FOLLOW UP: We will contact you several days after your job is completed to discuss how the job turned out. Again, your candor is appreciated. Content © Giron Roofing Inc. All Rights Reserved. 5633 SE 111th Ave, PORTLAND OR 97266.